(deoxyribonucleic acid) The substance of which genes are made and that determines the inherited characteristics. In eukaryotes, it is mostly confined to the chromosomes, where it is found in association with basic proteins called histones. Bacterial, mitochondrial, and chloroplast DNA is naked and forms circles or loops. 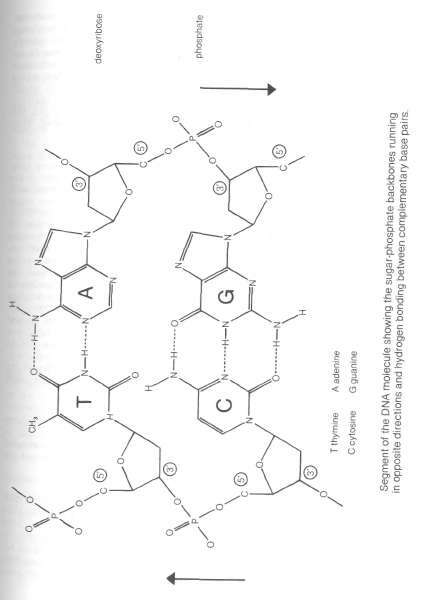 Typically a DNA molecule consists of two polynucleotide chains, forming a right-handed helix with one coil positioned more or less underneath the other (the double helix, see diagram). There are only four types of nucleotides in the polynucleotide chains, although each chain can be thousands of nucleotides long. Each nucleotide is constructed from deoxyribose sugar, esterified to phosphate and a base. The base may be adenine or guanine (the purine bases), or cytosine or thymine (the pyrimidine bases). The sequence of nucleotides in a polynucleotide chain ultimately specifies the sequence of amino acids in proteins, i.e. forms the basis of the genetic code. The phosphate groups are on the outside of the helix. Each polynucleotide chain is established and held together by the formation of further ester bonds between the phosphate group of one nucleotide and the deoxyribose sugar of an adjacent nucleotide in the same chain. For this reason, each polynucleotide is sometimes described as having a 'sugar-phosphate' backbone (see diagram). 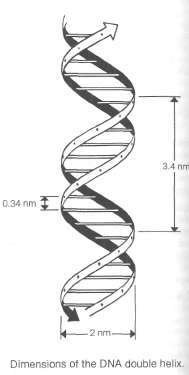 The two polynucleotide chains in a double helix are antiparallel, i.e. in one chain the sugar-phosphate backbone is composed of 3'-5' phosphodiester bonds, while in the other, it is composed of 5'-3' phosphodiester bonds. The bases are on the inside of the helix, and each forms hydrogen bonds with a complementary base on the other helix. By the formation of these hydrogen bonds, the two helices are held together. The base pairing is highly specific, adenine: thymine and guanine:cytosine being the only permissible combinations. Evidence that DNA is the genetic material is substantial. By means of *semi-conservative replication, DNA produces copies of itself with great accuracy, so that the genes (polynucleotide sequences) are normally passed on unaltered from one generation to the next. found in cells. The latter plays an important role in transcribing (copying) and translating (decoding) the genetic message during protein synthesis. In viruses the genetic material is much more variable and can be double-stranded DNA (e.g. T-even bacteriophage), single-stranded DNA (e.g. Ø174 bacteriophage), double-stranded RNA (e.g. Ø6 bacteriophage), or single-stranded RNA (e.g. tobacco mosaic virus). Segment of the DNA molecule showing the sugar phosphate backbones running in opposite directions and hydrogen bonding between complementary base pairs.